You may remember the book rack upcycle I did a few weeks back. I used an old book display rack and converted it into a pull-out pantry style shelf that sits between my fridge and the wall. It works really well and I am happy to say that the chalkboard art has stood up extremely well – in fact, better than I would have ever expected. Not a single image has been smudged and I have yet to touch-up anything. I can’t honestly say if this is because of the hair spray I top coated it with or if it is just because I only move it in and out using the handle. Either way, it works well and I really do love it. However, when I was making it I knew that the empty space above the pull-out shelf would bug me. It just looks like something is missing. So, I decided that I would use the other half of the display rack and convert it into a spice rack. 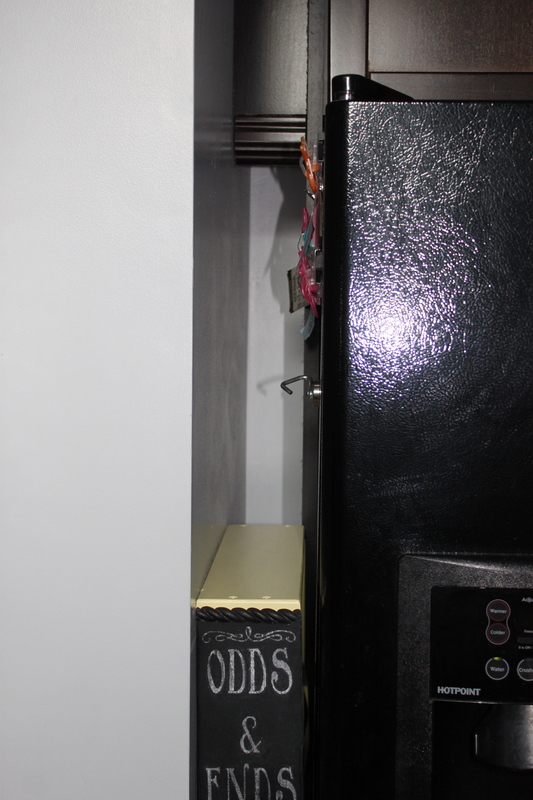 Here you can see the empty space above the pull-out cabinet that I upcycled into a pantry. I began by taking the second panel of the book rack completely apart and then had to spend quite a bit of time thinking about how this would work. My plan was to create a spice rack using the existing wood from the display rack. The depth of the space would accommodate the full 24″ of shelving, but in order for it to fit between the cupboard support board and the wall, I would need to make the shelves narrower. I thought this seemed like a super easy project as the modifications were quite minimal. 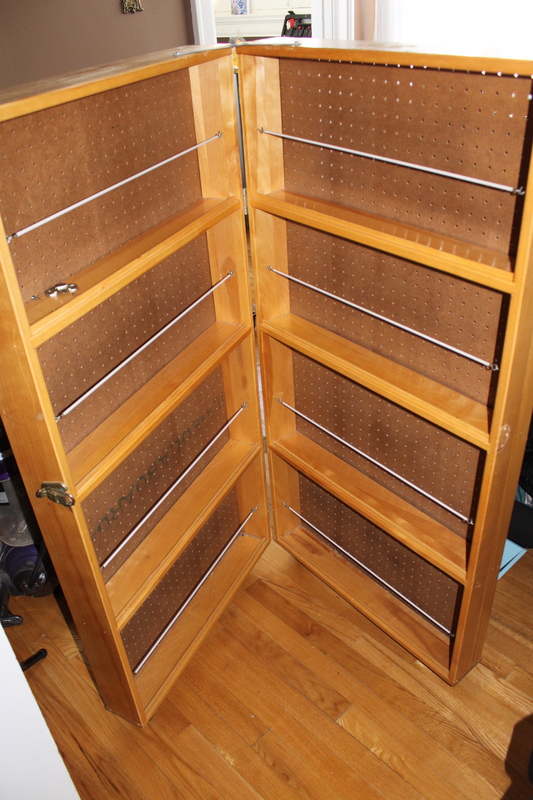 The issue was that there seemed to be lots of little details to think about: the thickness of the pegboard backing, whether to trim the back or front of the shelves, how to keep the little lip so the spice bottles won’t fall off, how far apart to make the shelves, how to make the cut shelves fit in the grooves they previously sat in, etc. I must say, I found it a bit hard to consider all of the details that perhaps wouldn’t even be considerations in a “new build”, but had to be accounted for because it was an upcycle. I got the boards cut and prepared to a point, but then had to ask my husband to help. The one and only tool that I’m not allowed to use is the table saw. I’m not exactly sure why, but Tim doesn’t feel that it’s very safe and at times I can be a bit careless. So, on Saturday I finally pinned him down and got the help I needed to do the final cuts. The new shelf is about 17″ high and 24″ long and should fit perfectly in the space, once the drawer runners are added. The front face of the shelf was not cut down as I wanted it to match the size of the bottom pull-out shelf. They won’t line-up perfectly because the bottom one is more centered in the space and the spice rack will end up sittng closer to the wall than the fridge. Keeping it the original 4″ width will also help to keep the contents of the rack somewhat hidden, as opposed to a more open look. We got the boards cut and nailed the shelf together. I used the original top and bottom pieces from the rack and one of the shelves, but had to insert a second shelf in between so that the final spice rack would have a total of three shelves. My plan is to move all of my small spice bottles to this rack. It should be large enough to fit them all, so I will have some additional drawer space in the kitchen and perhaps some room on my pull-out rack as well. We filled all of the holes with wood filler and let it dry over night. I am out of time and weekend, so this is how it will stay until I can get back to it. This will be the front end of the cabinet. You can see the side is wider to match the bottom pull-out cabinet. This shows the end that will extend to the back wall. It had to be narrower to fit in the channel beside the fridge. Here is the rebuilt rack. It is now the perfect size for my spices! The next step is to sand and prime the shelf, so that it will be ready for painting. I can’t wait to get it mounted and see how it works!